Retrofitting dams to provide more generation at peak times is one of the most immediate, cost-effective, and environmentally acceptable means of developing additional electric power. Sep 23, 2013 Update : Added HR 267 and HR 678 - In August, President Obama signed into law HR 267, the Hydropower Regulatory 8Efficiency Act, and HR 678, the Bureau of Reclamation Small Conduit Hydropower Development and Rural Jobs Act. The newly enacted laws will relieve some of the regulatory constraints that have impeded the development of small scale hydropower production in recent years. Many existing hydroelectric dams are fairly old (for example, the Hoover Dam was built in the 1930s), and their original design predated the newer intermittent power sources such as wind and solar by decades. A hydroelectric dam originally built to provide base load power will have its generators sized according to the average flow of water into the reservoir. Adverse Hydro - Water conditions limiting the production of hydroelectric power. In years having below-normal levels of rain and snow, and in seasons having less-than-usual runoff from mountain snow pack, there is then less water available for hydro energy production. Average Hydro - Rain, snow and runoff conditions that provide water for hydroelectric generation equal to the most commonly occurring levels. Average hydro usually is a mean indicating the levels experienced most often in a 104-year period. Discharge – The volume of water released. 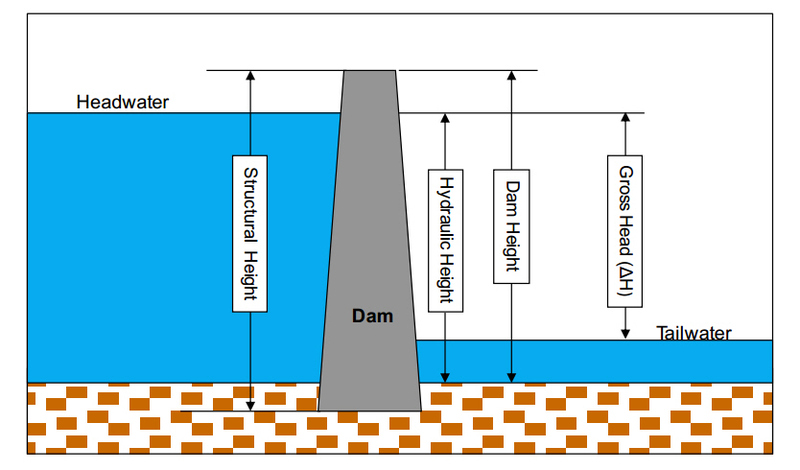 The actual output of energy at a dam is determined by the discharge and the head. Head - The vertical distance the water falls created by the dam height. The head produces water pressure, and the greater the head, the greater the pressure to drive turbines. This pressure is measured in pounds per square inch. More head or faster flowing water means more power. HR 267 - Hydropower Regulatory Efficiency Act of 2013 - Changes select Federal Energy Regulatory Commission (FERC) regulations governing project licensing to make it easier to develop smaller output hydropower stations. Signed into law Aug 2013. FERC issues licenses and regulates hydroelectric facilities under the Federal Power Act. HR 267 amended current law to provide for adjustments in three classes of small hydropower facilities. HR 267 changed current law to allow FERC in its discretion to exempt small hydroelectric facilities with a generating capacity of 10 MW or less from FERC's licensing requirements. Under the prior law, only projects of up to 5 MW were exempt. The new law provides a process by which FERC shall grant an exemption for "qualifying conduit hydropower facilities" (i.e., manmade water conveyances such as tunnels or canals operated for the distribution of water for agricultural or other purposes) with an installed capacity of 5 MW. The law amends current law to increase the scope of the Commission's discretionary exemption from 15 MW to 40 MW for small conduit hydropower facilities. Notably, these projects will still be subject to state and federal fish and wildlife terms and conditions pursuant to section 30(c) of the Federal Power Act. In contrast, the "qualifying conduit hydropower facilities" will not be subject to fish and wildlife terms and conditions pursuant to section 30(c). 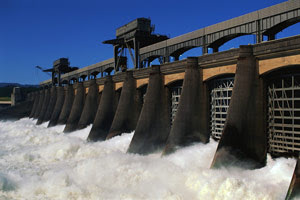 The law directed the Federal Energy Regulatory Commission to investigate the feasibility of a two-year licensing process for hydropower development at non-powered dams and closed loop pumped storage projects, develop criteria identifying projects that may be appropriate for a two-year process, and develop and implement pilot projects to test a two-year process, if practicable. The bill also allows FERC to extend the period of a preliminary permit once for not more than two additional years beyond the three years currently permitted, for a total of five years, to allow a permit holder enough time to develop and file a license application. A "conduit" is defined as a tunnel, canal, pipeline, aqueduct, flume, ditch, or similar manmade water conveyance. This bill changes federal regulations to foster the development of small conduit hydropower projects. Notably, HR 678 allows the Bureau of Reclamation to apply its categorical exclusion process under the National Environmental Policy Act of 1969 (42 U.S.C. 4321 et seq.) to certain small conduit hydropower development, excluding siting of associated transmission facilities on Federal lands. In addition, it calls for first offering leases of power privilege to an irrigation district or water users association that operates the applicable transferred conduit or that receives water from the applicable reserved conduit. If the irrigation district or water users association declines a lease of power privilege, the lease of power privilege will be offered to other parties. Thus, the newly passed legislation requires that preference is offered to water user organizations for the development of canal and conduit hydropower under the lease of power privilege process. HR 678 also designates the Power Resources Office of the Bureau of Reclamation as the lead office of small conduit hydropower permitting. H.R. 5892 - The Hydropower Regulatory Efficiency Act - This bipartisan bill (passed house in July 2012 by a vote of 372-0) – would facilitate the development of small hydropower and conduit projects and direct the Federal Energy Regulatory Commission (FERC) to study the feasibility of a streamlined two-year permitting process. Their legislation now moves to the Senate. The legislation would exempt from federal licensing requirements the nation's 1,100-plus hydro projects that aren't operated by the federal government and that generate less than 10 megawatts of electricity; the current exemption is limited to projects that generate less than 5 megawatts. H.R. 6247: Saving Our Dams and New Hydropower Development and Jobs Act of 2012 - Legislation introduced in August 2012 would strip federal funding from environmental groups that have challenged hydropower facilities in court over the past decade. The bill further would block federal money from being used to study or undertake dam removals, save for the rare occasion when Congress has authorized the action. "This bill would ... help eliminate government roadblocks and frivolous litigation that stifle development," Rep. Doc Hastings, R-Wash., said in a statement when he introduced it. With little time left in a Congress now mostly focused on campaign season, and with the 17-page Hastings bill poisonous to prominent environmental groups, the legislation appears fated for now to serve primarily as debate provocation. Hydrokinetic Projects - Produce power from moving water without the use of a dam, and include wave energy systems and in-stream turbines, which can capture the energy from tidal flows or the flow of a river. The first federally licensed in-stream hydrokinetic power project in the United States began operating commercially on August 20 on the Mississippi River in Hastings, Minnesota. The Hastings project, an in-stream turbine from Hydro Green Energy, captures the flow from the output channel of an existing hydropower dam. The turbine, anchored downstream from the dam on a tethered barge, has a nameplate capacity of 100 kilowatts, and an expected output of about 35 kilowatts. After approval of the project by the Federal Energy Regulatory Commission (FERC) last December, the turbine was quickly installed on the barge and has been undergoing testing since mid-February. In June, the turbine was evaluated for its impact on fish in the river, and an environmental research firm found that 97.5% of fish passing through the turbine survived the journey. Impulse Turbine - A horizontal or vertical wheel that uses the kinetic energy of water striking its buckets or blades to cause rotation. The wheel is covered by a housing and the buckets or blades are shaped so they turn the flow of water about 170 degrees inside the housing. After turning the blades or buckets, the water falls to the bottom of the wheel housing and flows out. Low-Head Dam - One with a water drop of less than 65 feet and a generating capacity less than 15,000 kW. Large, high-head dams can produce more power at lower costs than low-head dams, but construction of large dams may be limited by lack of suitable sites, by environmental considerations, or by economic conditions. In contrast, there are many existing small dams and drops in elevation along canals where small generating plants could be installed. New low-head dams could be built to increase output as well. The key to the usefulness of such units is their ability to generate power near where it is needed, reducing the power inevitably lost during transmission. NHAAP - National Hydropower Asset Assessment Program - The NHAAP Baseline Database describes the development and construction of the baseline engineering and geospatial information systems and integrated data sets that characterize the hydropower generation inventory in the United States. The NHAAP baseline database is designed to assess and analyze the existing national hydropower infrastructure and provide historical data to study and plan for future potential hydropower upgrades, as well as potential increases in the U.S. hydropower generation. NHD - National Hydrography Dataset - Provides a foundation for rigorous estimates of NPD potential for production for the entire country. 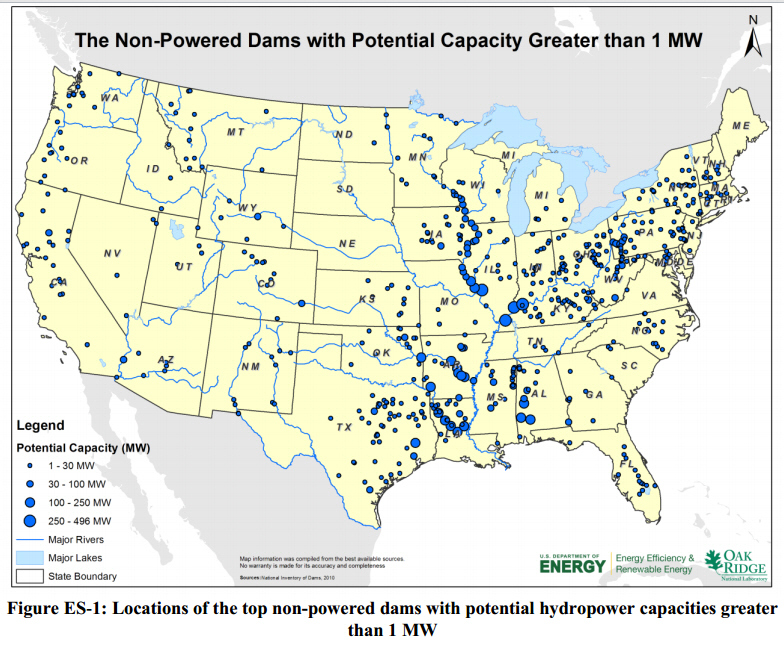 NPD - Non-Powered Dam - Dams that do not produce electricity - The United States has more than 80,000 NPDs providing a variety of services ranging from water supply to inland navigation. Importantly, many of the monetary costs and ;environmental impacts of dam construction have already been incurred at NPDs, so adding power to the existing dam structure can often be achieved at lower cost, with less risk, and in a shorter time-frame than development requiring new dam construction. Penstock - The pipe that carries the water from the reservoir to the turbine. Rated Capacity – The capacity which a hydro generator can deliver without exceeding mechanical safety factors or a nominal temperature rise. In general this is also the nameplate rating except where turbine power under maximum head is insufficient to deliver the nameplate rating of the generator. Reaction Turbine - A horizontal or vertical wheel that operates with the wheel completely submerged a feature which reduces turbulence. In theory, the reaction turbine works like a rotating lawn sprinkler where water at a central point is under pressure and escapes from the ends of the blades, causing rotation. Reaction turbines are the type most widely used. Stator – Stationary coil on the generator. When coils of wire on the rotor. sweep past, electricity is produced. As recently as 2005, Hydropower provided about 96% of the renewable energy in the United States. Uprating an existing dam with additional generators increases its peak power output capacity, thereby increasing its capacity to operate as a virtual grid energy storage unit. The United States Bureau of Reclamation reports an investment cost of $69 per kilowatt capacity to uprate an existing dam compared to more than $400 per kilowatt for oil-fired peaking generators. While an uprated hydroelectric dam does not directly store excess energy from other generating units, it behaves equivalently by accumulating its own fuel - incoming river water - during periods of high output from other generating units. Functioning as a virtual grid storage unit in this way, the uprated dam is one of the most efficient forms of energy storage, because it has no pumping losses to fill its reservoir. A dam which impounds a large reservoir can store and release a correspondingly large amount of energy, by raising and lowering its reservoir level a few meters. Linking wind power and hydropower can add to the Nation’s supply of electrical energy. Large wind machines can be tied to existing hydroelectric power plants. Wind power can be used, when the wind is blowing, to reduce demands on hydropower. That would allow dams to save their water for later release to generate power in peak periods. Adding power to U.S. NPDs has the potential to add up to 12 GW (12,000 megawatts or MW) of new renewable capacity—a potential equivalent to increasing the size of the existing conventional hydropower fleet by 15%. A majority of this potential is concentrated in just 100 NPDs, which could contribute approximately 8 GW of clean, reliable hydropower; the top 10 facilities alone could add up to 3 GW of new hydropower. Eighty-one of the 100 top NPDs are U.S. Army Corps of Engineers (USACE) facilities, many of which, including all of the top 10, are navigation locks on the Ohio River, Mississippi River, Alabama River, and Arkansas River, as well as their major tributaries. Lower Cost - The uprating of existing hydroelectric generator and turbine units at power plants is one of the most immediate, cost-effective, and environmentally acceptable means of developing additional electric power. Since 1978, Reclamation has pursued an aggressive uprating program which has added more than 1,600,000 kW to Reclamation's capacity at an average cost of $69 per kilowatt. This compares to an average cost for providing new peaking capacity through oil-fired generators of more than $400 per kilowatt. Reclamation's uprating program has essentially provided the equivalent of another major hydroelectric facility of the approximate magnitude of Hoover Dam and Powerplant at a fraction of the cost and impact on the environment when compared to any other means of providing new generation capacity. Reduced Environmentl Impact - Many of the monetary costs and environmental impacts of dam construction have already been incurred at NPDs, so adding power to the existing dam structure can often be achieved at lower cost, with less risk, and in a shorter time-frame than development requiring new dam construction. The abundance, cost, and environmental favorability of NPDs, combined with the reliability and predictability of hydropower, make these dams a highly attractive source for expanding the nation’s renewable energy supply. Peaking - Since hydroelectric generators can be started or stopped almost instantly, hydropower is more responsive than most other energy sources for meeting peak demands. Water can be stored overnight in a reservoir until needed during the day, and then released through turbines to generate power to help supply the peakload demand. This mixing of power sources offers a utility company the flexibility to operate steam plants most efficiently as base plants while meeting peak needs with the help of hydropower. This technique can help ensure reliable supplies and may help eliminate brownouts and blackouts caused by partial or total power failures. Dispatchability - Nuclear and fossil fuel plants are not efficient for producing power for the short periods of increased demand during peak periods. Their operational requirements and their long startup times make them more efficient for meeting baseload needs. Unfortunately, while traditional gas peaking plants can react quickly, even they generally need 15 minutes or more to ramp up their power output. Energy Management - load following, and frequency control helps protect against system failures that could lead to the damage of equipment and even brown or blackouts. Complements Existing Renewable Portfolio - There is major potential found in the Ohio, Upper and Lower Mississippi, and Arkansas White-Red regions. Therefore, new NPD development can help diversify the geographic distribution of national hydropower investment. More importantly, hydropower is found to be a complementary energy source with other renewables. While more wind and solar power potentials are found in the western and southwestern United States, hydropower development through NPDs can provide clean renewables for other regions in the nation. Environmental Impact - Increased water surge and decreased water quality. Intermittency - Some hydroelectric units operate intermittently, when sufficient water flows. Hydroelectric plants also occasionally shut down because of environmental restrictions. In August, 2014, the Federal Energy Regulatory Commission (FERC) approved a pilot to test a two-year licensing process for hydropower development at non-powered dams and closed-loop pumped storage projects. The 5 MW project proposed by Free Flow Power Project 92 (FFP) will be located at the Kentucky River Authority's existing Lock and Dam No. 11 on the Kentucky River. In compliance with the Hydropower Regulatory Efficiency Act of 2013, FERC investigated the feasibility of a two-year licensing process, developed criteria for identifying projects that may be appropriate for the process, and developed the pilot project. In addition to approving FFP's request to test a two-year process, the approval letter issued by the Office of Energy Projects requests that the developer conduct studies relating to project hydraulics, water quality, aquatic habitat, fish entrainment and survival, cultural resources, and rare, threatened, and endangered species. Rentricity - New York, NY- Instead, a water agency will install a micro-hydrokinetic power system from Rentricity in the Los Angeles rivier that will effectively generate 225 kilowatts of electricity from pressurized water flows controlled by the agency. Specifications for L.A.'s Flow-to-Wire system for L.A. are being written and could be complete in nine months to a year. Another 30-kilowatt system is being designed for a municipal water agency near Pittsburgh. The key is that man-made pressurized water flows are not going away. Water agencies – along with heavy-duty private sector water consumers like oil refineries and agribusiness – have to pressurize water to purify it or move it. Approximately 19 percent of the electric power in the state of California is consumed in processing and moving water. To get water to a particular elevation, for instance, a water agency might have to pressurize water to 67 pounds per square inch. Once the water gets to the desired location, a large percentage of that pressure likely dissipates. Rentricity essentially wants to capture that pressure to create electricity before it disappears. Worldwide, Rentricity estimates that 25,000 potential sites for micro hydro exist. Potentially, the market for micro-hydro equipment could amount to $30 billion. The company already has six other proposals in the pipeline. The Low Impact Hydropower Institute (LIHI) - Wartburg, TN - A non-profit 501(c)(3) organization dedicated to reducing the impacts of hydropower generation through the certification of hydropower projects that have avoided or reduced their environmental impacts pursuant to the Low Impact Hydropower Institute’s criteria. China has been hot in generating hydro-electricity power due to rising power energy in their purchases. Their massive Three Gorges Dam have generated electricity down the basin but the unblocking drains due to the sediments is a monumental task.